We Rokuhan will exhibit our products at the 19th JAM (Japan Association of Model Railroders ) held in Tokyo Big Sight. 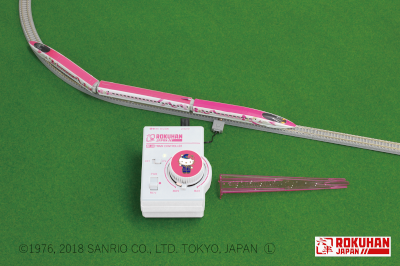 The main feature of this time is "Tobu Limited Express 500 Type REVATY", which will release this month and "500 TYPE Hello Kitty Shinkansen" which will release in October 2018. Also, we show many Rokuhan prototype models will be released in this year and early next year. We will sell some exclusive products only to get at Rokuhan online shop or showroom, also various kinds of Rokuhan products. 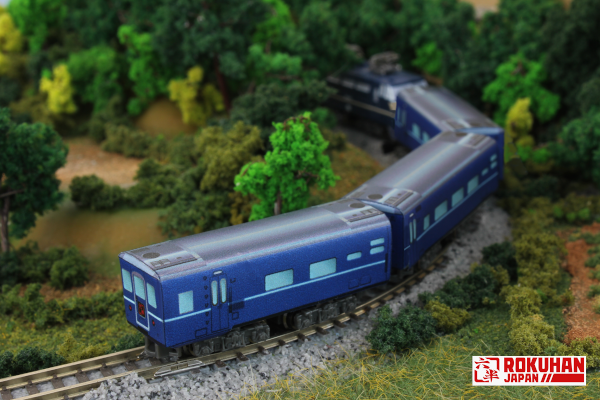 In addition, other model train makers and suppliers will have various event. Please be informed that office will be totally closed from August 11th to 16th, as summer holidays. We will resume our business on August 17th, Friday. We open Aug. 11th through 15th, 18th, 19th, 25th, 26th. Please be informed that showroom will be closed on Aug. 16th and 17th. Information about ROKUHAN TOKYO SHOWROOM: Rokuhan Tokyo Showroom's Opening Hour! New release of Z Shorty Type 923 Doctor Yellow! Thank you for your continued interest in ROKUHAN products. We would like to introduce New Shorty Body series "Doctor Yellow." electrical wire condition by hi speed run. Type 923 has special function like maintenance car and has brilliant yellow color body. Therefore, this is called "Doctor Yellow"
Redesigned short body and express distinctive window and pantograph design. then it can be run on ROKUHAN and other Z gage tracks. Including 3 drawbar for connecting 3 dummy chassis. Image and pictures are not final. Appearance and specifications subject to change without prior notice. damages and troubles, if it is used for other purpose. Please follow on Facebook:New release of Z Shorty Type 923 Doctor Yellow! Introduction of ROKUHAN DCC Decoder!! Thank you for your continued support and interesting ROKUHAN products. We will introduce following new products again because of sooner sales start in Japanese market. A053 is smaller and general use type DCC Decoder and can be put in Z Shorty chassis. A059 is best fit with ROKUAHN locos which can be set ROKUHAN room light. It is no affect for locos appearance and ordinal room light function..
We will introduce both products by movie for your easy understand. Also we will put primly information about new Turnout/Accessory Decoder. We will start sales on A053 and A059 on early JUL/2018. * Turnout/Accessory Decoder spec. and design are subjective because it is under developing. Please follow on Facebook:Introduction of ROKUHAN DCC Decoder!! 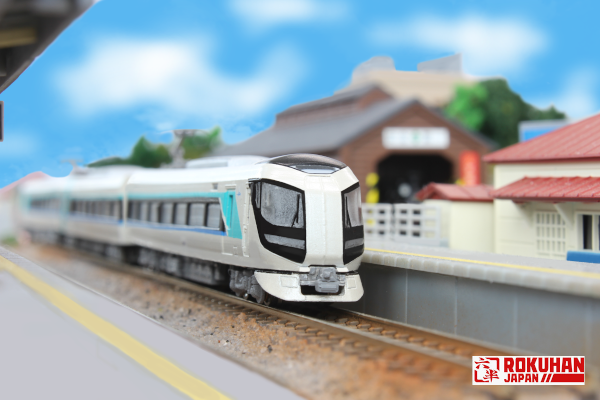 Delivery of " SA007-1 SHORTY Passenger Car (Blue) " will start in August!! Thanks for your continually interesting on ROKUHAN products. We add. SA007-1 Z SHORTY Passenger Car (Blue) on Shorty series. Included detachable dummy chassis for desk top. Can be put consumer apply label sheet on each shell. and can make blue color passenger cars as default..
Can be pulled them by any motor chassis and make run on ROKUHAN tracks. Also can be set them on SA001-1motor chassis too and make run like Diesel loco. on any flat table as accessory products. Consumer make decoration on the shell or put own designed label. This is good product for custom box car made. We will release this product in Japanese market around on AUG/2018!! Please follow on Facebook:Delivery of " SA007-1 SHORTY Passenger Car (Blue) " will start in August!! 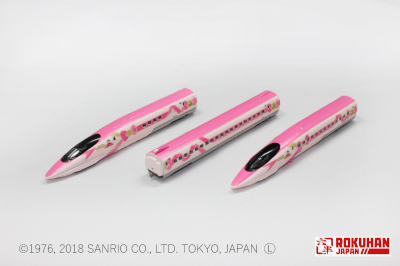 New release of 500TYPE Hello Kitty Shinkansen! 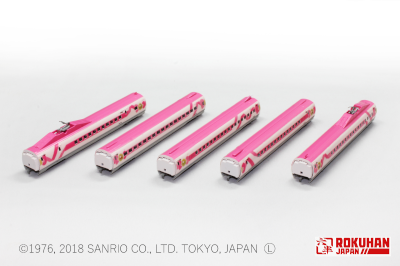 We would like to introduce of 500TYPE Hello Kitty Shinkansen models. It has started commercial travelling from June 2018 by the West Japan Railway Company after finished Evangelion version. *Consumer can set up full line up by "3 Cars Extension Set + 5 Cars Extension Set" or Starter Set + 5 Cars Extension Set". *3 Cars Basic set and 5 Cars Extension set are packed in special Hello Kitty case. Rokuhan is allowed sales 500TYPE Hello Kitty Shinkansen model trains only in Japanese market. Therefore, Rokuhan cannot sell them at other oversea market. 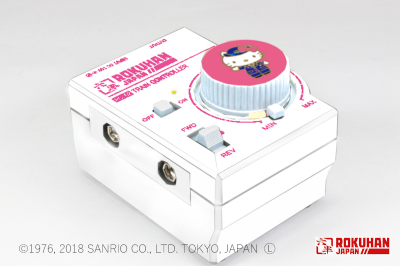 *RC02 Controller has special Hello Kitty decoration. We will start deliver in November 2018 at Japanese market. *Image and motion pictures are not final. Appearance and specifications subject to change without prior notice. Please be advised that we shall not be responsible for any breakdown, damages and troubles, if it is used for other models. 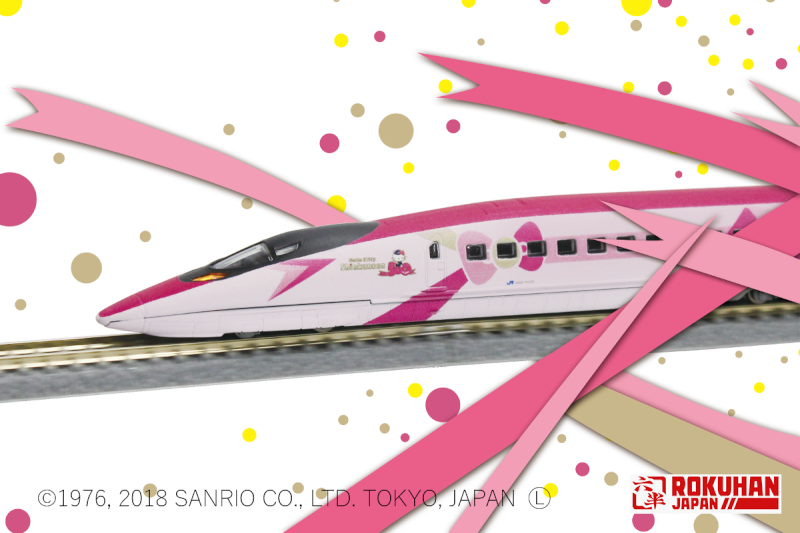 Please follow on Facebook:New release of 500TYPE Hello Kitty Shinkansen! Introduction of A053, DCC Decoder Room Light Multiple Type! Rokuhan make up A059 DCC Decoder room light multiple type. A059 can be covered all of Rokuhan locos which are set room light unit even required length adjust by cutting tool. You can easy to start DCC operation together with C005 e-Train controller by using A059 Decoder. *Can be fit any Rokuhan locos which are set any room light units even require soldering work. *Can be used for some of N scale locos. Room light A type mode: 113K, 14K, 24K (only Sushi Dining car), 115K, 415K, 50K,103K, E6Shinkansen Mid cars. Room light D type mode: 500K Shinkansen Mid cars. We will start delivery A059 in July 2018. We will start deliver A059 in July 2018. *All appearance and specifications subjet to change without prior notice. Please follow on Facebook:Introduction of A053, DCC Decoder Room Light Multiple Type! Introduction of "Revaty" Tobu Limited Express 500 Type! You can make run the newest modern color and design "Revaty" with realistic formation. It is a new limited express train set of Tobu Railway. Actual Revaty train car organization is 6 cars ( Kegon 3 cars + Aizu 3 cars) and Revaty start at starting station by 6 cars. They are separated at half way station by Kegon 3 cars and Aizu 3 cars. Kegon and Aizu each goes to different direction after detach. You can be built up actual Revaty organization by T034-1 and T034-2. * Kegon: printed each car number based on 501 formation. Aizu: printed each car number based on 502 formation. * T034-1 or T034-2 can be made actual organization cars with G006-1 "Revaty starter set". * Rokuhan Revaty Front and Tail cars has dummy coupler as default. * Kegon and Aizu has bellows cover and Arnold coupler as accessories parts Kegon and Aizu are connected by charging coupler and put bellows cover as above photo. *Be informed Kegon and Aizu has different labl sheet. * Each set has included consumer apply label sheet which can be used for the Rokuhan station series. You can make image of Tobu Railway station. * Head /Tail light On / Off slide switch for light On / off when make run by 6 cars. * Revaty" Tobu limited Express 500 also offers starter sets for Z gauge beginners, too!! * Printed each car number based on 503 formation. * G006-1 Revaty Starter Set can be made actual organization cars with T034-1 or T034-2. *Be informed Kegon and Aizu has different label sheet. * Head / Tail light On / Off switch for light On / Off when make run by 6 cars. We will start deliver in August 2018. Please make reservation for our products of your Rokuhan hobby retailer. Please follow on Facebook:Introduction of "Revaty" Tobu Limited Express 500 Type! 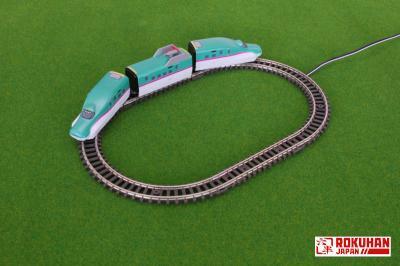 Introduction of R091 Curved Track Without Track Bed R45mm 180° x 2 pcs. and R092 Straight Track Without Track Bed 55mm x 2 pcs.! 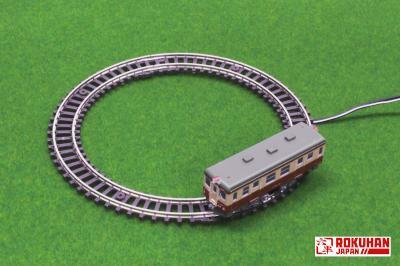 We introduce new track set R091 Curved Track Without Track Bed R45mm x 180° x 2pcs. and R092 Straight Track Without Track Bed 55mm x 2 pcs. Consumer can make the smallest oval track by those 2 track packs. *It has classic type tie color (Brown). *1st ROKUHAN curved track without track bed. *Can be connected this with existing any ROKUHAN tracks. *Can be built up Pizza layout track around DIA. 100MM for Z shorty. *Metal lug is put under track, so feeder cable can be fixed with R091 by soldering. *This is 2nd ROKUHAN straight track without track bed. *Useful track length for any track layout. *Can be used it for Z shorty and original Z scale cars. *Consumer can make the smallest oval track layout together with R091 R45-180deg. We will release them around on early July 2018 in the Japanese market. We will start deliver in July 2018. Please make reservation for our products of your Rokuhan hobby retailer. Please follow on Facebook:Introduction of R091 Curved Track Without Track Bed R45mm 180° x 2 pcs. and R092 Straight Track Without Track Bed 55mm x 2 pcs. !